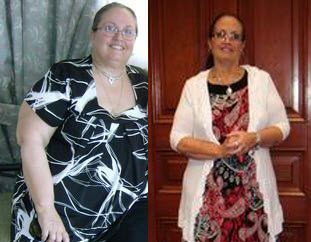 How I Gained It: When I was at (what felt like) my lowest point in my life, I was at my highest weight of 345 pounds. In August 2008 I lost my job, a week later I lost my Mom to cancer and less than two weeks after that I lost my grandmother to congestive heart failure. If I saw it, I ate it for the most part. I wasn’t really aware of what I was eating, how much, when or if I was even hungry. I ate to reward or comfort myself. But I am also of Italian and Filipino heritage, and both of those cultures (like many others) socially center around food. Breaking Point: After all “the dust had settled” I realized I had a choice: to wallow and be consumed by grief or to start the rebuilding process. Part of getting back up meant I would have to confront the fact that my family’s medical history was full of issues. I had control over one aspect of that — my weight. How I Lost It: Since I now had time on my hands with no job I started to fill my schedule with healthy activities and focused on making healthy food choices. My first step was literally just that — a step. My mom had been an avid walker, and when I saw what cancer did to her body I started to walk in honor of her. At 345 pounds, walking was enough of a challenge for me, but it was also a time for me to spiritually connect with my mom. Within a year I lost 50 pounds. Then life started to happen some more. I had two part time jobs, went back to school and about 10 pounds came back on, after handling a stressful move for work and losing my cousin to breast cancer. I recommitted myself to my original goal and joined Weight Watchers. With Weight Watchers, my recommitment to myself and my new-found love for boxing and running, I’ve lost another 90 pounds. Since 2008, I’ve gotten back to working full time, I earned my masters degree and I’m currently studying for my personal training/group exercise/holistic health certifications and training for half marathons (my new love)! I’m more aware of what I’m eating. I like taking comfort food classics and turning them into healthier entrees. I’ll try anything once, but it won’t pass my lips if it’s not something that is beneficial to me and my body. I turn to food for fuel instead of comfort or reward. 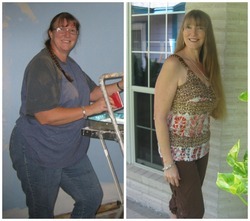 It’s no longer just about improving my life and health but helping others find their own health success. I’ve done this all with the amazing support system of my family (physically and spiritually), boyfriend and friends. I’ve not only physically improved my health but mentally, emotionally and spiritually become healthier, too. I was always that “big kid” but now I’m in the best shape of my life, and I couldn’t be happier! It’s not about fitting into a summer bathing suit, but being the best version of myself so I can live the life I’ve been blessed with! After Weight: 205 pounds. My goal weight is 174 pounds. Well done with all of your hard work!!! I was 330…now I’m 259 and still shrinking. wow! what an emotional ride you have been on! I think your awesome and inspiring! Good I’m glad for u! Your mum would be so proud. I give you lots of credit. You are AWESOME. ..
Wow! What an awesome job she did! Great story! It inspires me to go further. I know I am on the good track but support is what I need. It is what goes on between your ears that keeps you slim. Not what goes on between your teeth! Is the article wrong? 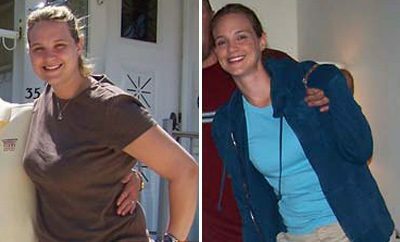 There’s NO way her before pic is at 345! That’s wonderfully inspiring to me since I’m going through some very similar things. ..
Great Job!! Looking great lady!! I live boxing too!! 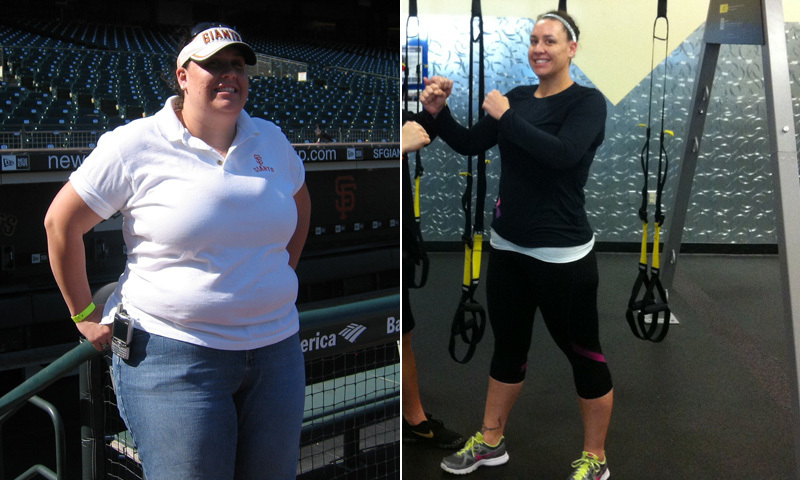 Paying for similar results….what an inspiration!! I love these postings! It is really motivational for losing weight. That’s the motivation u need to hear. I had tears in my eyes bcz I’ve given up on my life and my dogs and just wallow in my sorrows and am so hard on myself. This won’t change everything for me bcz I still have to make the decision to get up and go, but it’s definitely inspiring. I only weigh 160 and I’ll b happy at 130. It’s just getting my life back on track and getting healthy and finding success with work and striving to achieve and find a hobby. I don’t have friends and family for support. Maybe somehow I may find something thru here. Yea yea!! Keep it up!